When travelling with a dog in your car remembering a few important points can aid the journey and keep you and your dog safe. Ensure your dog has had a walk before any long car journey. More importantly make sure he has been to toilet so you do not have any accidents on route. Stop every hour to allow your pet to stretch his legs and ‘do his business.’ Always pick up after your dog. Groom your dog well before a long car journey otherwise dog odours will invade your car and you and the other passengers will smell like dogs. Wash his face and check the rear end for any debris as you do not need this in your vehicle. 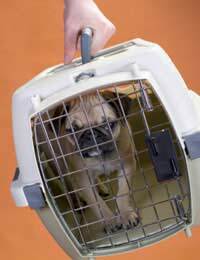 Some dogs sleep in cages or crates and feel secure. This may be the way for your dog to travel in your car. Anchor the cage to the car so that it cannot move especially in an accident. There should be two safety routes from the cage just in case your vehicle is involved in a shunt. Seat belts for dogs are a very common sight these days. Available in pet shops, pet stores and online as well as car accessory shops they clip to the rear seat belt fastening so your dog is not able to move far or be catapulted forward in an accident. The seat belts resemble a harness that fits around the chest area; some have a double use with clips for dog leads. Every dog must wear a collar and identity tag by law. Your dog’s name and your telephone number are adequate. Better still a mobile telephone number so that you are always contactable. Micro chips are another way to identify a dog but they are not that reliable and it also necessitates police and other services having a scanner and being bothered to use it correctly. Join an association such as Pet Log for further security for your poet. Do not feed or water a dog before a journey as accidents can happen. Although iced water may seem a nice option your dog may develop gastric torsion and die if he drinks too much water in one sitting. Dogs and hot cars are words that seem to go together during summer months. The answer is to keep your dog at home unless you really need to take him out with you. Never leave the animal alone in the car with the window slightly open – it will not give enough air to your dog and he will very quickly overheat and die. When travelling with a dog always carry extra bags for picking up after him along with a spare dog lead. Some dog food and water will also be handy if you break down or need to stay out longer than normal. First aid kits for dogs are available from pet shops and should be kept in the cart along with the human version. One never knows when you need to help your own dog in an emergency or if another dog is injured in an accident. Take care when approaching any injured dog. Use the spare lead to muzzle the animal as it will snap out if in pain. A little forward planning when travelling with a pet can make the journey run smoothly.